Go ahead and insert your own favorite alternative synonym for the excrement of a male bovine. This is paranoia, folks. 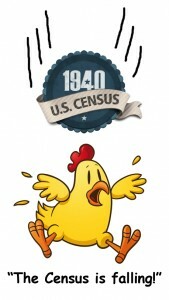 Ain’t nobody gonna be using the 1940 census systematically to defraud Americans. First and foremost, we are all at far greater risk of identity theft each and every time we hand a credit card over to somebody who takes it out of our line of sight to process a charge or hand our Social Security number over to a file clerk to enter in our records than we are from access to census information. We’re at much much higher risk every time there’s a security breach in a computer system storing our current information — as just happened recently4 — than anybody is from the paltry facts included in the census. Griping about the risk of identity theft from 1940 census data is a little bit like complaining that your tea is cold in the dining room of the Titanic just after it struck the iceberg. Maiden names? You’re kidding me, right? My parents are both listed in the 1940 census with both of their mothers. Neither of the mothers’ maiden names is shown, only their married names.7 I’ve looked at a LOT of 1940 census pages already; beyond my own family pages, I’m also doing indexing. You know how many maiden names I’ve seen? None. Not one. Nada. Zilch. To find the maiden name of the mother of a man living today, you need to know who his grandparents were. Finding him in the census won’t do it. And to find the maiden name of the mother of a woman living today, you have to know her maiden name just to find her on the census, and then go back beyond her parents to find her grandparents. And in both cases, even if you had all that info to start looking in the census, you still wouldn’t get the right maiden name if there was a divorce or death and then a remarriage. Just how many identity thieves are going to put in that much effort, hmmmm? Middle names? You’re still kidding, aren’t you? My father’s middle name isn’t in his census record. Neither of my grandfathers’ middle names are shown. Guess how many middle names the enumerator in my Chicago grandparents’ enumeration district wrote down? Yep, you got it. Exactly none. In many cases, the enumerator didn’t even write down the first name, but used initials only. And birthdates? Excuse me? What birthdates? 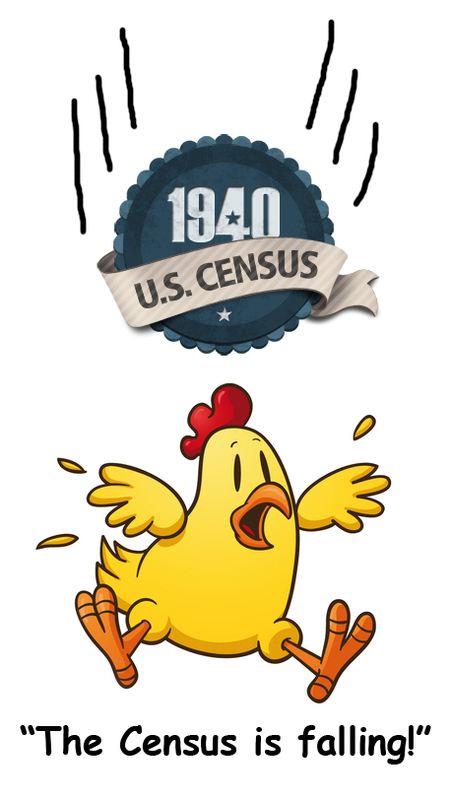 You know how many birthdates appear in the entire 1940 census, start to finish, all 132 million entries? None. There’s an age given, but no date of birth at all. My German grandmother told the enumerator she was age 49 and my father was 18.8 So tell me, doom and gloom folks, what year was each of them born? Was she born in 1891 (and had already had her birthday in 1940) or 1890 (and wouldn’t turn 50 until after the census)? Was he born in 1921 or 1922? If you can’t tell me the year of birth, pray tell, what good is the census in determining the date of birth? The naysayers then warn that senior citizens could be conned into giving up information because identity thieves can find out what street they grew up on. No, from the census, assuming you can find the person at all (remember 85% of those enumerated are dead now), you can find out only what street the person lived on in 1940,9 and only if the person lived in an area urban enough to use street addresses and even then only if the enumerator wrote that information down. And then you have to make the leap to the conclusion that American senior citizens are so damned dumb they’ll hand over info to anybody who calls or emails talking about that street. Gimme a break!!! But at a minimum we should “consider restricting the general publication of answers to sensitive questions,” one doomsayer demands.10 Uh… what sensitive questions? There aren’t any phone numbers in census records. There aren’t any Social Security numbers in census records. No bank account data. No asset information, except maybe if you owned your home or rented it. There aren’t any deep dark secrets here and nothing of interest or even use to identity thieves. Chicken Little panicked when an acorn fell from a tree. These nitwits are panicking at a nonexistent threat based on misinformation and, I daresay, deliberate fearmongering. Me? I’m not buying this nonsense for a nanosecond. You tell ’em, brother. You tell ’em. If these con artists are that good at extracting that much data from the 1940 census, they can make a lot more money offering their services to genealogists than they can running a scam! Ain’t that the truth!!! I’d hire ’em to break down some of my brick walls, for sure! They’d be rejecting the blue life preserver because it might be too cold!!! Dingbats, the bunch of ’em. A great post… This has needed to be said. My great-grandfather was listed as Henry Austin Carringer, and my great-grandmother as Abbie Della Carringer, so some enumerators did list middle names when offered. Of course, they were 87 and 78 years old at the time. Thank you for this clear-headed rebuttal. An excellent article Judy…as usual! Maybe we should all post the link to it in the comments section of the online Chicken Little news sites where these hyped up spin articles are found. Sorry, but I disagree. Some of these articles have been thoughtful and not every thing that is pro-privacy is not anti-genealogy. While the chances may be higher to get scammed by a credit card company, my own mother had a scam run on her the days following the running of my father’s obituary. Never say never …… forewarned is forearmed you know. Your father’s obituary was easy to find and had CURRENT information of immediate use to a scammer. His mother’s maiden name in the 1940 census? Please. Let’s be serious here. Well, I’m going to make that SOME journalists will say or write anything. Since, in one of my past lives, I was one… and — I suppose — with The Legal Genealogist am one again! Betsy, that literally made me laugh out loud. If politicians and pundits had to be informed, the airwaves and the halls of Congress would be sooooooo quiet!